Welcome a new chat app for Bitrix24 - CRMbot - an easy way to interact with your CRM. You can use it to generate instant reports and interact with your CRM in a new format. The bot generates instant reports for the key indicators of company's sales activity - deals & invoices. 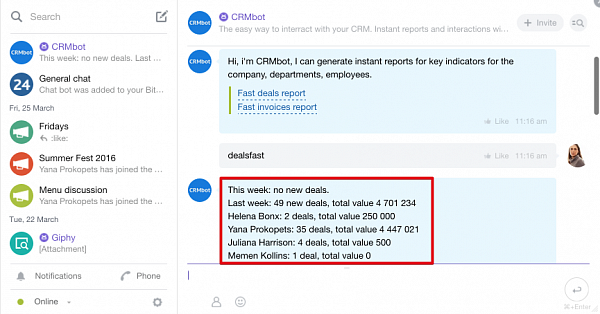 Users interact with the CRM via Bitrix24 Instant Messenger - a totally confidential and secure way, since CRMbot does not store any data you have requested. CRMbot is smart too - the generated reports are based on the user access rights.